Heavy duty steel body with comfortable non-warming handpiece. Handpiece is designed with eight individual non-flammable wires to provide optimal flexibility and heat resistance. Handpiece is made of lightweight fiber to stay cool and accommodates most tips of other wax workers. A sturdy handpiece holder is located on the top right of the machine. 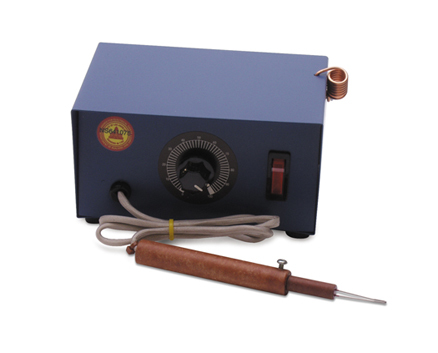 The control box on this unit delivers precise heat and can be precisely varied for different waxes and effects. Standard in 120 volts. Unit is UL listed and approved to meet and exceed all safety standards. The unit is standard with a three-prong grounded plug for maximum safety. The on/off rocker switch is illuminated when the unit is on. Furnished with one tip (WAX-207.01). Full one year warranty on all parts and labor.